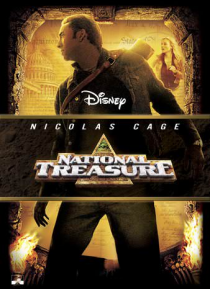 NATIONAL TREASURE is a thrilling, edge-of-your-seat adventure starring Nicolas Cage as Benjamin Franklin Gates. Ever since he was a boy, Gates has been obsessed with finding the legendary Knights Templar Treasure, the greatest fortune known to man. As Gates tries to find and decipher ancient riddles that will lead him to it, he's dogged by a ruthless enemy who wants the riches for himself. Now in … a race against time, Gates must steal one of America's most sacred and guarded documents -- the Declaration of Independence.